1. 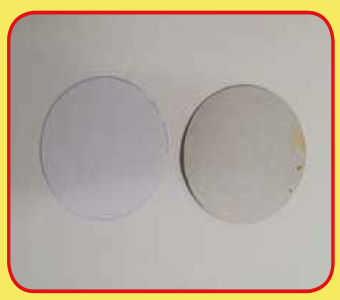 Use the lid to trace a circle on the white paper and cardboard. Cut both of them. 2. 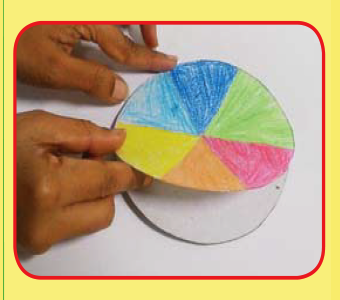 Using a pencil and scale, divide the circular sheet of paper into 6 equal parts as shown, and colour each in a different colour: purple, blue, green, yellow, orange and red. 3. Glue the paper to the cardboard. 4. 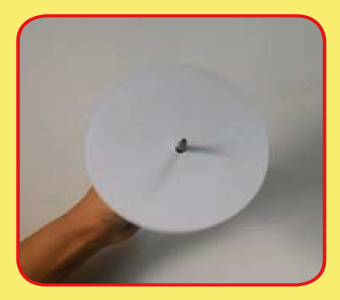 Make a small hole in the centre of the disc and poke a skewer through it. 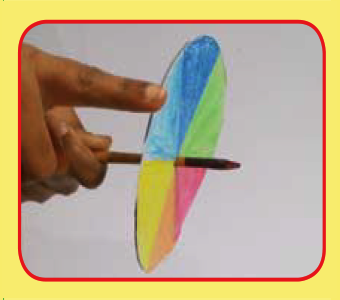 Hold the skewer and spin the colour disc. As you spin the disc fast, you will see that the different colours start to merge and appear as one colour (white). Why do the different colours combine and appear white? First, the colours combine and appear as one because of the way our eyes read moving images. 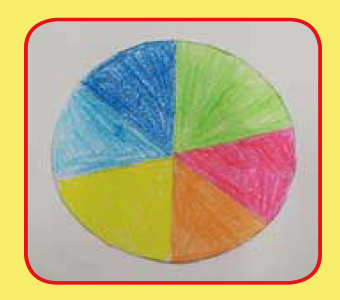 When the disc spins, our eyes cannot register the colours separately, and hence perceive them as one. Second, the colours combine and appear white because of the composition of white light. All types of light travel in waves of different frequencies. Our eyes can only see lights that travel within a specific range of frequency called the visible spectrum. This spectrum consists of lights of different colours: red, orange, yellow, green, blue, indigo, and violet. When these colours are combined or travel together, they fuse into one to form white light. So, when the disc spins, the colours combine and appear white. The (white) light that we receive from the sun is composed of several colours. 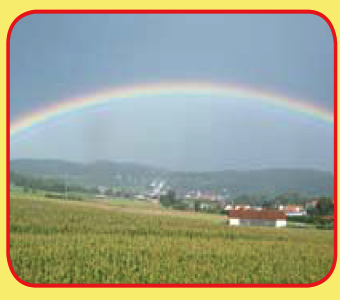 When a beam of sunlight passes through rain drops (which is why we see rainbows mostly during the monsoon), at a certain angle on its way down, it splits into the different colours it is composed of, thus forming the rainbow.